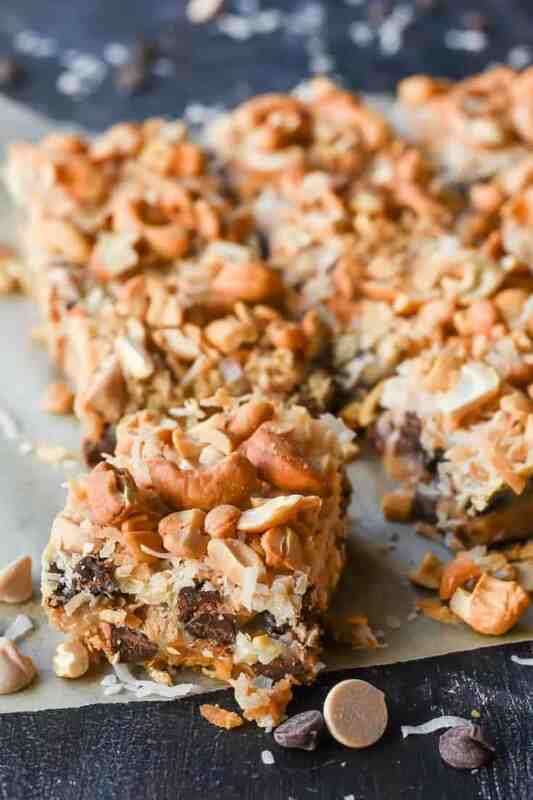 These rich and decadent 7 Layer Magic Bars filled with chocolate, caramel, coconut, and cashews are a fun and easy dessert for any occasion! Each year, my mom and I set aside a day around the holidays to bake and decorate cookies. We always begin the day with bright eyes and bushel-fulls of energy. At 10 AM, making a quadruple batch of cut out cookies sounds like a fabulous idea. And why not throw in a batch or two of Linzers while we’re at it? And pecan pie bars, too! We’ve got all day! By 3 PM, our energy is flagging. The table is covered with flour and remnants of cookie dough. We’ve got sheets of star and Santa and snowman cookies sitting naked on the countertop, waiting to be iced and sprinkled. We stare at the dishes in the sink and the unbaked cookie dough waiting to be dropped and suddenly quadruple batches of anything seems like a terrible idea. Still, we persevere, and by 10 PM we’re barely standing, but we have boxes and boxes full of lovely cookies to share with friends and family. Mission accomplished. This year, knowing we’d have an eager “helper” along for the ride, my mom and I decided to adjust our expectations for the day and scale back to something a little more, ahem, reasonable. We made a double batch of these gluten free cut out cookies from King Arthur Flour, which were fabulous by the way, but we also left ourselves time to be interrupted by little hands digging into powdered sugar bowls and a little voice asking us to stop and play trains. 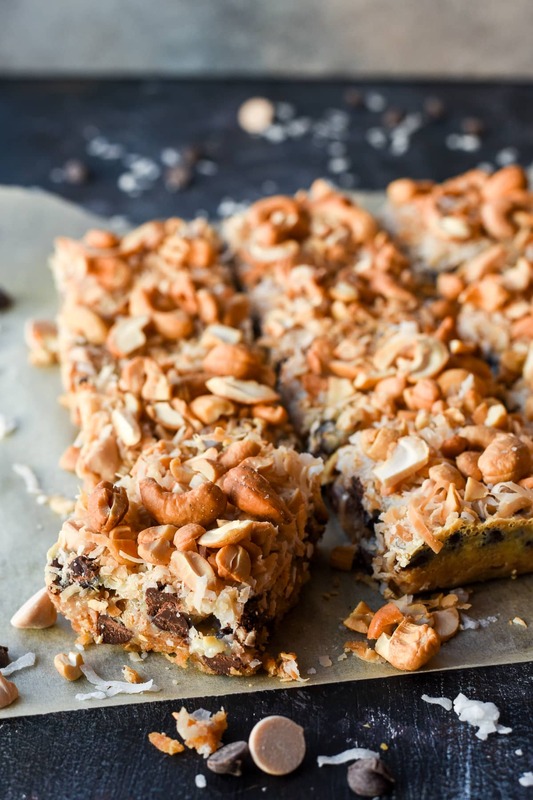 The only other thing we attempted were these 7 Layer Magic Bars, which are practically the definition of easy. 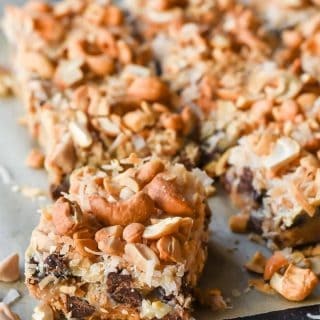 Many of you will probably recognize these from your childhood, where you may have known them as Hello Dollies or just 7 Layer Bars. 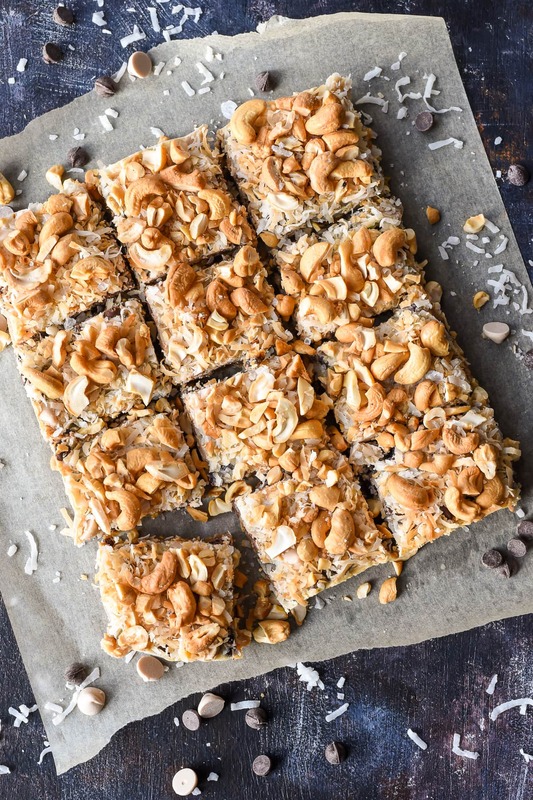 They start with a simple graham cracker crust that’s layered with condensed milk, chocolate and butterscotch chips, shredded coconut, and nuts. While they bake, the condensed milk and chips form an ooey gooey layer of sweetness and the nuts toast to a lovely golden brown. The recipe is very forgiving and great for experimentation. I’ve been wanting to use cashews in a dessert recipe for awhile, so I subbed a few butterscotch chips for caramel and topped the whole thing with big, buttery cashews. These are really good and really rich. Similar to fudge, a small bar goes a long way, unless of course you sprinkle the whole thing with flaky sea salt. Then, suddenly, it becomes hard to stop at just one bar. At the end of this year’s baking extravaganza, we only had about 3 dozen cookies and a tray of magic bars to show for our hard work. And yet, we weren’t tired or stressed or overwhelmed. Instead of focusing all our energies and expectations on the end result, we were present for each other, enjoying the time we had together. And that’s really what the season is all about, right? I’ve been thinking a lot this season about expectations, and how Jesus doesn’t seem to care much about meeting any of ours. The Israelites had great expectations for their long-awaited Messiah. They were waiting on a King, longing for someone to burst on the scene in glory and might. Instead, they got a baby. A fragile, helpless baby, conceived by the Holy Spirit to an unwed teen mom. Let that sink in a minute. These are some supremely unmet expectations. They expected a conqueror, and instead they got a carpenter. They wanted someone to reign, and they got a man on a cross. This Messiah ate with criminals and touched the unclean. He welcomed children and women, and criticized the religious elite. This was not the Messiah they wanted. He was far better. I find I’m often the victim of my own expectations this time of year. I long to give the perfect gifts, wrap presents so lovely they’d make Joanna Gaines jealous, and make ridiculously happy, idyllic memories with my family. In reality, my presents are often wrapped hastily and without care, the kiddo is sick and misbehaved, the hot chocolate spills everywhere and the sprinkles get smashed into the furniture, and I find myself finishing the season with a vague sense of disappointment. Another year gone, another year that’s less than perfect. How much different might it be if I let go of my expectations and looked for the ways Jesus is meeting me in the quiet, mundane, every day moments? What if I looked for the baby instead of the conquering King? What if I found him in the mess and noise and chaos, among the lowliest of people in the humblest places? What if I stopped trying to manufacture the magic of the season and instead embraced the miracle that’s already here? What’s here–what’s real–is the tender, fierce love of a newborn King who sacrificed all the glitter and glory of Heaven to enter into our dirty, messy lives. And that’s far better than any Christmas I could ever expect or imagine. Preheat the oven to 350 degrees. Spread the coconut out on a baking sheet and toast, stirring every 5-6 minutes until just barely golden. Remove from the oven and set aside. 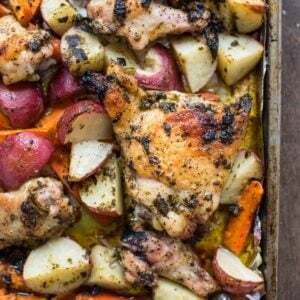 Meanwhile, spray a 9 inch square baking pan with cooking spray then top with a sheet of parchment paper. Leave the parchment long enough to drape over the edges and act like a sling for lifting the bars out after baking. Spray the parchment with cooking spray. Mix together the graham cracker crumbs and butter. Spread the mixture on the bottom of the baking pan, pressing it down with your fingers. 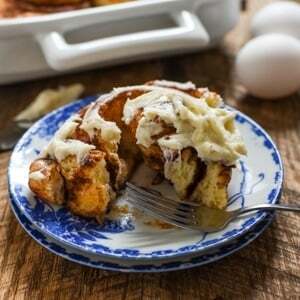 Drizzle the condensed milk evenly over the top. Do not use a spatula to spread it, as this can mess up the crust. In order, sprinkle the chocolate chips, caramel chips, coconut and cashews over the sweetened condensed milk. Press the layers into the milk gently with your palm so they stick. Bake for 25-30 minutes or until set. Cool completely (I'm serious on this one, you actually have to cool these completely or they're a gooey mess). Use the sling to lift the bars from the pan. Sprinkle with sea salt if desired. Cut into small-ish pieces (I usually get 16 bars out of this), and serve. Bars can be kept covered at room temperature or stored in the fridge. They'll last several days if you can keep yourself from eating them all! 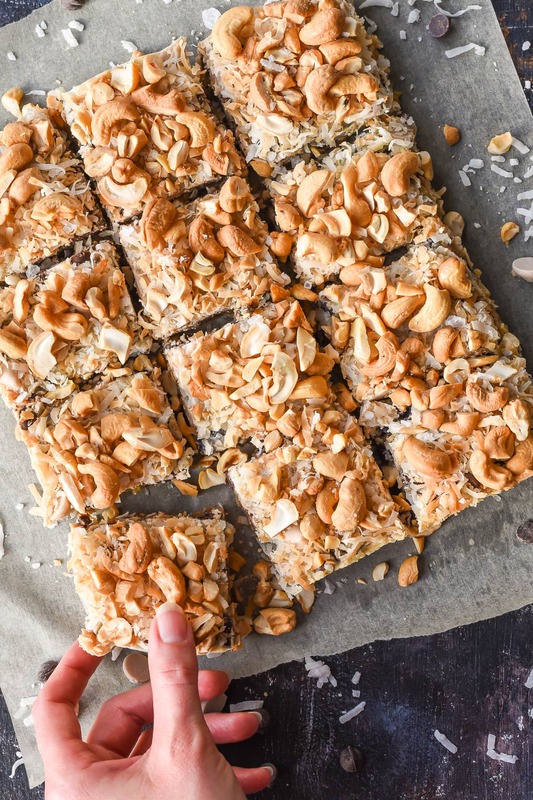 This recipe is super flexible and can really accommodate any combination of chips and nuts you'd like to try! To make the recipe gluten free, simply substitute the graham crackers for gluten free graham crackers (such as Schar or Pamela's), and check all of your packaging to ensure your other ingredients weren't processed with other items containing gluten.